Hasn’t this been quite the year for this country. From constant political storms creating worldwide uncertainty about where we’re all headed, to horrendous natural storms and disasters one after the other, heart-rending gun violence across the country … and then there’s Las Vegas. And now terribly destructive and lethal wildfires ravaging California‘s wine country. The Beatles sang “All you need is love” … to which we add “and lots and lots of hearts“. Recently-minted CZT Liza (Maria-Liza) Kostic of Somerset, New Jersey is here today with lots of hearts and her Leading Heart tangle. I attended CZT 28 seminar this past June. This pattern was inspired by a stage background that I saw on a television show. I don’t remember what show it was & I drew the pattern from memory so I can’t swear I reproduced it exactly. When I first tried to recreate the pattern, I did it as a grid pattern. If you’ll notice in the monotangle, the squares with the hearts are drawn from the inside “corners” of the 4 circles. To keep myself from getting confused as to where the place the next line, I kept repeating to myself “Lead From The Heart” so that is how its name came about. As Zentangle® patterns have no up or down, for my example I reversed the direction of the middle row. Also added a touch of shading for some texture. 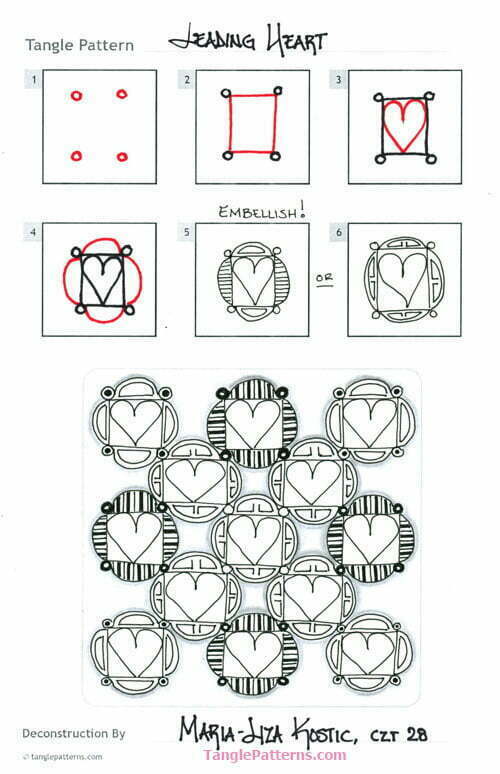 Liza illustrates the step-by-step instructions for drawing Leading Heart below and features it in a pretty monotangle demonstrating some embellishment variations. Check out the tag lizak for more of Liza’s tangles on TanglePatterns.com. Liza, thank you for the hearts. They are very much needed right now. I was already stressed about all the horrible things that have happened, and here I am right where this latest disaster is still taking place. I live just barely north of where these fires have been happening in Santa Rosa and have been on high alert to be ready for evacuation if I need to. Tangling has been very important to help me through this time. That and good neighbors and family (who are all safe). I didn’t look at your link, Linda, because I’ve already seen too much. I’ll come back and look later. Thank you for posting this wonderful loving tangle. Thinking of you Melena and everyone affected by these fires. Keep us posted on your status and be safe! Thanks so much for your thoughts. Everyone in Sonoma, Napa and Mendocino Counties appreciate all the good wishes from all over the world. So, this is an update. This morning’s news was good and terrible at the same time. The fires closest to me have been contained at 40% now. (whew) However, the east side of Santa Rosa up Hwy 12 toward Sonoma blew up last night with the high winds that came through the higher hills and down the canyons. More evacuations. So sad. But there are fire services from all over the state and other states all over. We are so grateful. I haven’t gone out yet and when I finally get over to my Mom’s I will have to go by some of the area that was burned. Not looking forward to it as my eyes will probably be filled with tears. But I am fine and the CZT in the area that I know (Deborah Butterfield) is fine too. I could go on and on, but I’m sure you don’t want to hear of all the sadness here. You see enough on the TV. Be safe everyone and take care of those close to you. Melena, I’m glad to hear that you are safe. I hope this little tangle was able to lift your spirits, even if only in some small way. My heart and my prayers go out to everyone affected by the devastation left by the fires. Stay strong and stay safe. LizaK, thank you so much for your loving thoughts. This tangle has uplifted my spirits. I really like it and have had some time to play with it. Things have quieted down considerably. Not sure what the containment percentages of the fires are now, but the smoke is down a lot. People are back to trying for a normal life, but that is going to be harder for some. The evacuations have been lifted in most places now also, but not all. There are still some fires burning but the fire crews are focusing on getting those completely contained. Now I know what you go through with the hurricanes Linda. Not exactly the same, but they both can have horrendous consequences. Be safe everyone and tangle on! Thanks Lisa for some love in this world with a wonderful tangle. Hearts and hugs to all in CA, PR, VI, FL & TX who have been impacted by all the stuff mother nature had dished out this year. Has affected many of us, even those not living in those areas. We had a trip canceled to Porto Rico last month because of the storms. Love and hugs to all. Yes, there has certainly been some extreme weather this year! Thank you for the kind words. Love and support are surely two very important benefits of being a part of the wonderful Zentangle community. Share the love! Thanks for sharing. This one is fun to do to see all the multitude of variations I can come up with.